This is what will happen when the polar ice melts and sea level rises. Well, not really. It’s just a continuation of a prank that started forty years ago. In 1978, a student party named Pail and Shovel swept the students election at the University of Wisconsin. During their campaign, the party made absurd promises that included installing escalators on Bascom Hill, painting the curbs fluorescent so drunk students could find their way home from the bars, flooding Camp Randall for faux naval battles and having all deans stuffed and mounted. None of these ever materialized, of course. 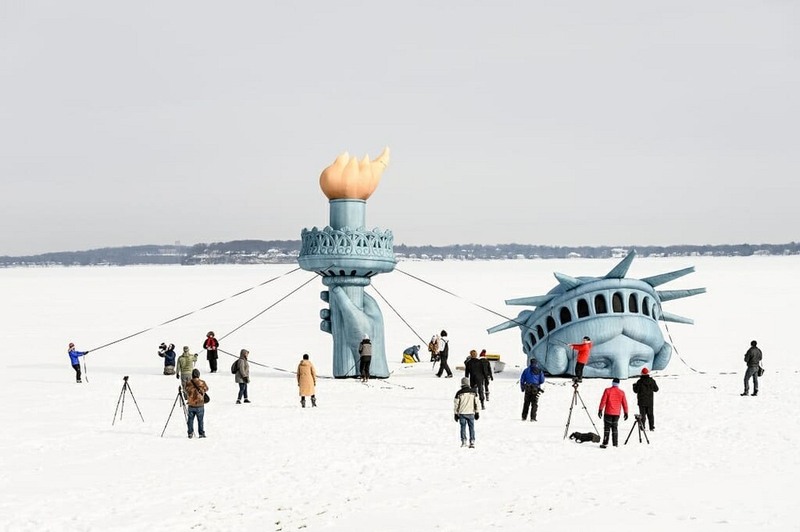 The party itself was named after its campaign promise to “convert the UW’s budget into pennies for students to collect on Library Mall with pails and shovels.” One of their promises they did make good on was bringing the Statue of Liberty to Wisconsin.